The collectible in question is none other than Tommie Smith's 200 metres medal from the Mexico City Olympics, won by the track & field athlete and American Football League star in 1968. Smith's medal will be up for sale alongside his cherry-red Puma running shoes. According to reports, Smith's single black glove from his famous salute after the victory would also have been auctioned - but the star doesn't know where it is. 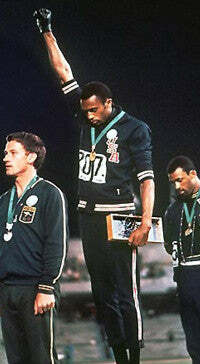 Smith's Black Power salute was a noted human rights protest and one of the most overtly political statements in the 110 year history of the modern Olympic Games. A press agency photographer was on hand to capture the moment (left). While the sale of both items was Smith's choice, he has declined to be involved in the sale or give interviews. "Of course the medal is important to him, but the memory of winning the race is far more important," the auction house's Gary Zimet told the Mercury News. "He is doing it for the money, but not because he is desperate. If someone is willing to pay his price [then he'll sell it]." Tommie Smith's medal and shorts will go under the hammer at New York-based firm MIT Memorabilia on November 4. The lot is estimated at $250,000 - and will likely attract the interest of collectors, investors and museums alike.